Following the events of last Sunday in Corinth detention centre, today the detainees of Komotini started an uprising. Left.gr reported that gun shots have been heard from within the prison and smoke was seen. A solidarity demonstration was held outside the detention center this afternoon, while extra police forces arrived to “control” the situation. The new mass detention centres in Corinth, Komotini, Xanthi, amigdaleza and Drama are hosting huge numbers of detainees (200-800) under miserable conditions. Only last month the detainees heard of the new law extending detention periods. Desperate and without any information on the period they will have to survive there they have started protesting first in Corinth and now in Komotini. The first of 30 detention centers for undocumented immigrants that the government is planning to open over the next two years is to be located in the administrative region of Attica (the area around Athens). According to government officials it will be located in the deserted Air Force camp in Katsimidi, near Mount Parnitha, north of Athens. The ministry of national defense had sent the “ministry of citizen’s protection” a list of six inactive military camps that could be converted into immigrant detention centers, out of which Katisimidi was chosen. On Sunday morning 7 immigrants were transferred to Attiko Hospital in Athens after the inmates of Amygdaleza detention center set fire on their beds and mattresses. The immigrants were Palestinians, Algerians and Libyans, probably underage. Five of them were taken to hospital with respiratory problems and two with burns. On Saturday afternoon immigrants held in the detention center of Fylakio, Evros, set fire to mattresses. Border police forced the inmates out of the building, where they were guarded by riot police units, while fire brigade that arrived from the city of Orestiada managed to put out the fire. One immigrant was transferred by ambulance to the Medical Center of Orestiada. Only recently the Doctors Without Borders (MSF) denounced that for almost a month, there has been no medical care to immigrants and asylum seekers in detention in Evros region. Meanwhile, greek navy and coast police keep searching for survivors from early Saturday shipwreck near the island of Kefalonia. Unfortunately the number of dead will probably rise to 19. Detained immigrants attempt suicide at Imathia police stations. Three immigrants detained at police station cells for “illegal entry in the country” attempted suicide in the last week in different detention spaces of Imathia Prefecture, Western Macedonia Region, Northern Greece. They all had been kept in police cells for months under horrible conditions. An Iraqi detainee at the police station of Veroia set desparately two matresses on fire; he was saved by the police when they took notice of it. Another Iraqi at Naousa police station tried to hang himself with his bed sheets. The third detainee was also an Iraqi, 32 years old, at the border guard station of Georgianoi. He also tried to hang himself and was saved when his fellow detaineed heard his cries. 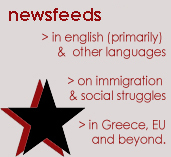 source: athens indymedia repost of a Tuesday, March 30, Rhizospastis newspaper article. the first protest in Bulgaria for the rights of immigrants and refugees ever…. Here is a small report from yesterday…. Sofia, Bulgaria – On March 20, 2010 to the “Home for the temporary accommodation of foreigners” in the quarter Busmanci from 11 am to 13 pm held a peaceful protest rally against arbitrariness and repression against immigrants and in defense of their human rights. —- Gathered about 40 people to protest against this antihumanno place for the immediate release of people in general and against the state policy against people detained there. 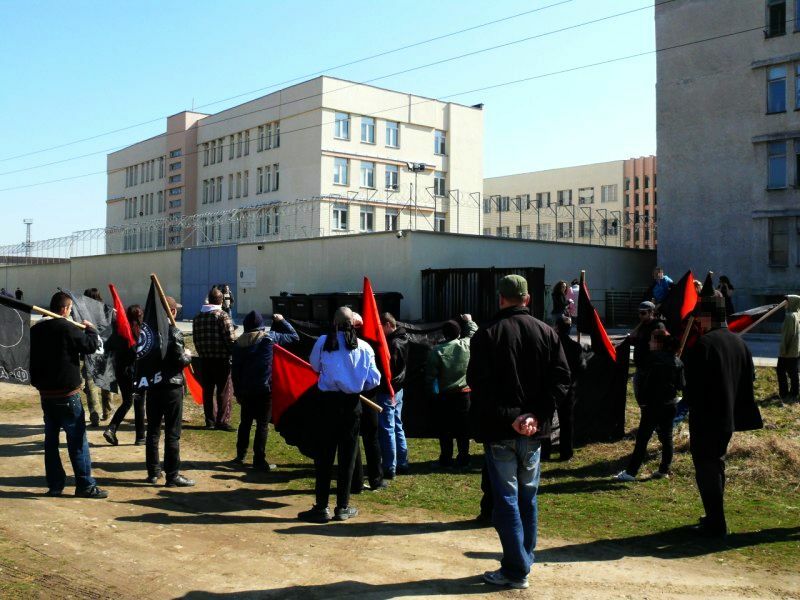 The protest was organized by the Civil Initiative Committee and the Federation of Anarchists in Bulgaria. —- Anarohsaprotiva attended by activists, lawyers, friends of the detainees at the center, bloggers, and citizens. Despite good weather and sent press releases – the place had a TV and 2 journalists. None cameraman nor any other journalists. However, police were in place, ie before the high walls of prison long before the protesters. Video-duty cop was also on his post. People in prison have been informed of protests and even in the kind of people stood in the first bars. Dozens of hands with Victory sign to pass through the narrow bars. Many of the people inside were tied hands and mouths with rags, probably torn sheets. Many photos showed through the bars of their children. Provesiha handmade banner with the inscription Busmantzi – Freedom;. Throughout chanting – Guantanamo,Freedom, Human Rights we want Freedom … attempts to chanting in Bulgarian. By the protesters was distributing leaflet on the problem and the newspaper “Free Thought”. Leaflet was read during the megaphone, for a short talk and a former prisoner at center. Chants were in Bulgarian and English slogans such as “There’s no Illegal people,” “*Papers for All or No Papers at* All!” The freedom of movement is everybody’s right, we are here and we will fight, “Busmanci – Guantanamo”, “No borders, no nations stop deportation” and others. It was a little parade down the street to jail. Police did not intervene, and after half an hour the protesters withdrew, arguing before the high closed that “we will be back, this is only the beginning. People long waved through the bars and shouting “Thank you” while the group away. 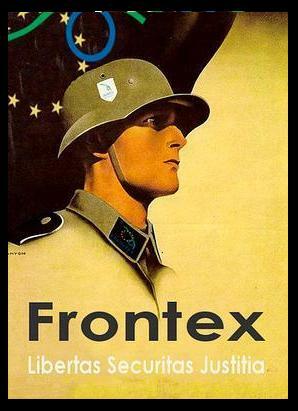 This was the first protest in Bulgaria for the rights of immigrants and refugees ever…. Political prisoner from Togo to be deported – sweep operation in Patras. The political prisoner Adoui Aboudou Wassiou from Togo is at risk of deportation to the tyrannical regime of his country of origin. Since last Sunday he has been detained at the Achaia, Peloponese Police headquarters. Adoui was charged for possessing a fake visa, and although he was acquitted at court he is still detained and to be deported. In case Adoui is deported his life would be jeopardized because of the difficult political situation in Togo. He was probably transferred to Athens last night until next Thursday when his deportation is believed to take place. 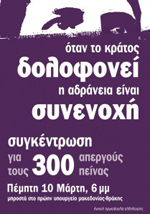 At least 150 economic and political refugeesof have been arrested in Patras. Given the lack of places of detention in the Police Headquarters of Achaia, the majority of detainees have been transferred to Agrinio and Pyrgos (nearby cities); these are people mainly from Sudan and Somalia. Yesterday a delegation of the Immigrant and Refugee Advocacy Movement visited the Director of Security of Patras, discussed the matter and was authorized to determine the needs of the detainees and aid them. Among the prisoners there are enough people of Albanian nationality, as well as Afghanis, Palestinians and possibly Algerians.